While many Christians seem to be content to stay on the sidelines of the intellectual war over ideas, research polls demonstrate the intellectual attacks that have been waged against Christianity on college campuses is taking a toll on Christian young people — 70% to 88% of Christian young people disengage from their faith after attending college for just one year. In one study it was determined that 90% of youth active in high school church programs had dropped out of the church by their second year in college. Fifty-one percent of Christian young people are now expected to actually renouncetheir faith by the time they graduate from college. Given the statistical evidence that a great majority of Christian young people on college campuses are disengaging from their faith or, worse yet, recanting it, Christian adults can no longer afford to ignore the intellectual challenges made to the Christian faith by emotionally charged skeptics and atheists. It is time for Christians to educate themselves on the issues and prepare themselves to respond to the intellectual objections made against Christianity in a passionate, yet gentle and respectful way (1 Peter 3:15-16). When Christian young people walk onto a secular college campus, someone on that campus will try to convince them God doesn’t exist, religion is responsible for the evil in the world, scientists have proven the universe came into existence due to a quantum fluctuation, the theory of evolution has been scientifically proven and explains how life began and evolved to its present state, that Christianity is based on nothing more than myth and legend by people who can’t face the realities of living in a godless universe and Christians are a bunch of intolerant hypocrites who want to force their beliefs on everyone else. In a national survey, churched teenagers were asked to identify the people who had the most influence on them in matters of life and faith. Mom was number 1 and dad was number 2. The next critical spheres of influence were other adults in that teenager’s life. So, clearly, the problem isn’t that Christian adults don’t have influence with their young people, it’s that Christian adults aren’t using their influence in an effective way. In the same study, only 12% of Christian teenagers reported having regular dialogue with their mother about faith or life issues. When it came to fathers, the number dwindled to 5%. Christian adults cannot continue to sit back as large numbers of Christian young people disengage from their faith and hope that someday they will find their way back to God. The price is too high, the scars are too deep and the effect on families and future generations is too severe. Slideshow Photo: Poster advertising the debate between William Lane Craig and Christopher Hitchens at Biola University (www.biola.edu). 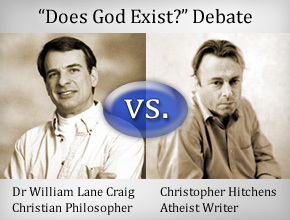 A DVD of the debate entitled “Craig vs. Hitchens: Does God Exist?” can be purchased at www.http://apps.biola.edu/apologetics-store/collections/existence-of-god.